Across the Pine Ridge Reservation - a historic hotspot - hearts swell with pride or cringe with fear as the strong-hearted men and the life givers of the nation come together to camp at the Red Cloud Building. 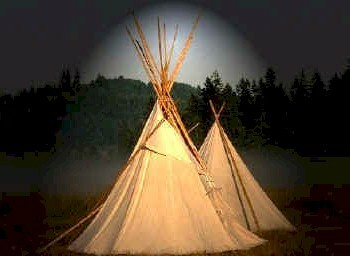 Today marks the tenth day of the encampment at tribal headquarters. What brings us together? Decades and centuries of dehumanization and oppression have weakened many Lakota spirits. In addition, the IRA tribal government, long the agent of oppression, is dying a slow death as we uncover the blanket of oppression. While our Reservation suffers from every aspect of colonization, the spirits and hearts of many Lakota have become stronger. The depth of human suffering on the Pine Ridge Reservation manifests in high levels of drug and alcohol abuse; elder, woman and child abuse; poverty; low educational levels; and early death from poor health conditions and worst of all, death of the spirit through suicide. What else? Sacred dreams shared by women in the Red Cloud Building reveal that this event is meant to be and is guided by the strength and truth of our sacred canupa. Prayers are offered daily in front of the alter which holds the sacred pipes, staffs and the tobacco ties. The alter is located in the Council chambers, jokingly referred to previously, as the "torture chamber". Now the round room is filled with an air of peace and prayer. At night the room is filled with women, elders and children, sleeping under the security and safety of the canupa. During the day, we are re-educated in the ways of the Lakota culture through dialogue with the old people. We listen respectfully, we laugh and we cry when we hear the stories of those left broken hearted by the IRA system, the Bureau of Indian Affairs and by those individuals who have taken on the role of the oppressor. We remember our parents, our grandparents, and all the ancestors who died of broken hearts because they did not have the opportunity to participate in the joys of equal employment, equal housing, equal protection. We remember the landowners who died without enjoying the privileges of being a landowner. For physical nourishment we feast on soup, fry bread, and wojapi brought in by the poor and unemployed. Their generosity and compassion brings tears to our eyes and strengthens our spirits. From the stories and teachings, we realize that our Lakota values are still alive and can be used to form a leadership process which reflects the values and teachings of the sacred Lakota way. Who is behind us? We receive calls and messages from the Oyate across the Reservation, across the United States and from foreign countries telling us to stand strong as they continue to pray for all of us. We receive calls from tribal employees expressing gratitude to the people for standing up for them against the abuse imposed on them by the IRA government. Grandmothers and grandfathers call to tell us that they are too poor to come into town but they are with us in spirit. Callers from other Lakota, Dakota and Nakota nations call in and tell us that our effort is providing a model for their people. So now we know that the "sleeping red giant", as one grandmother described our people, has finally awakened.